12th February, 2015: FISHING REPORT: Port Alberni Inlet, Barkley Sound, Ucluelet (West Coast), Somas-Stamp River System. It’s again a New Year for sport salt water fishing and many sport fishermen, guides and potential guests are beginning to think about the many sport fishing opportunities that await them in 2015. 2014 was a fairly memorable year on the scenic West Coast of Vancouver Island. Chinook fishing for migratory salmon headed to distant southern watersheds began in late April and continued through the late spring and summer. Salmon returning to local streams and rivers arrived in August and continued in relatively good numbers into September. In the Alberni Inlet Sockeye returns were not as high as forecast but returns were still over 1.2 million. The 2015 West Coast Vancouver Island sport fishing season which will begin in the late spring and continue into the summer and early fall months looks to be very similar to that of the 2014 season. The Sockeye season in the Alberni Inlet will again once again be fairly good with numbers hopefully reaching 600,000. The Inlet is a great spot to sport fish as the Alberni Inlet water is fairly quiet and pristine. Barkley Sound and offshore Ucluelet should be strong as good numbers of Chinook and Coho migrate to those distant watersheds. Winter fishing for Winter Steelhead in the Stamp River has been steady and winter (feeder) Chinook fishing in Barkley Sound and around the quiet hamlet of Bamfield and also the Ucluelet Harbor has been off and on with some reasonable fishing opportunities on those days that the winter season offers. The Stamp River had excellent returns in terms of the summer run of Steelhead and to date returns of winter Steelhead have been good with the peak of the current season expected in February. 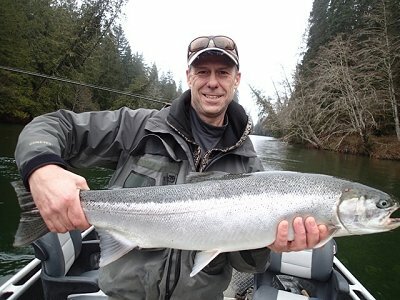 There has been some good sized hatchery Winter Steelhead in the mid teens with a few reaching the Upper teens to date. At times during the winter months a few schools of Winter Chinook will make their way up into the inlet and feed on bait fish in the Bells Bay and Nahmint-Franklin areas. This happens periodically but most years the Alberni Inlet has the best sport fishing from mid June to mid September. The Somass River Sockeye begin migrating into the river in May and usually begin to school in good numbers around the 10th of June. When the Sockeye build up in big numbers the sport fishing action for the number one commercial salmon really heats up and is a lot of fun for all fisher persons young and old. Sockeye fishing often can continue into the first ten days of August. It is then that the first few Chinook salmon appear in the Inlet. 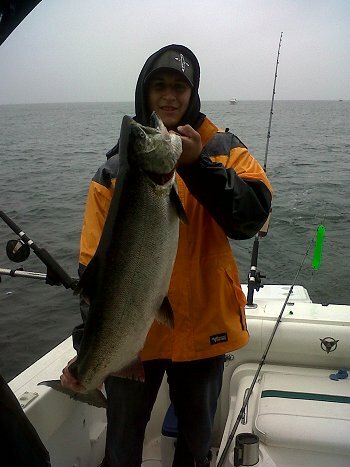 Chinook fishing is followed by Coho with the peak of the Chinook season often occurring around the Labor Day Weekend when the Port Alberni three day Labor Day Weekend fishing derby occurs. 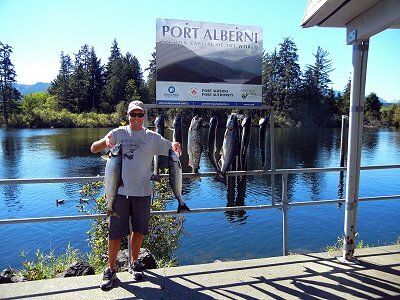 The Port Alberni Inlet is a wonderful and very easy area to fish. Many people worry about rough water but the Inlet waters for the most part are very calm. The best fishing time for Sockeye is in the morning hours and the last two hours before dark. Sockeye salmon do seem to be active at any time of the day which makes this sport fishery a very popular opportunity for everyone. Barkley Sound waters are very much like the Port Alberni Inlet. The Sound is protected on both the east and west coastlines. Fishing in the Sound could occur every month of the year without fear of experiencing the big waters often found offshore in the winter and even during the summer months. Winter Chinook fishing has been off and on. Recently the Bamfield Wall and Samatao Bay has had some very good Winter Chinook fishing. The 2015 mid winter months have had some good weather patterns and fairly productive fishing days. The best fishing areas as mentioned have been the Bamfield Harbor mouth, the Bamfield Wall, Samatao Bay as well as Swale Rock, Vernon Bay, and the Canoe Pass outside entry points. Pill Point, Sarita Bay and the Poett Nook area are also other spots worthwhile to fish in February and March. The last few weeks has had some anglers fishing the Bamfield Wall. Anglers have had opportunity to land a few Winter Chinook in the Fifteen pound range. There have been several feeders in the seven to nine pound range and many undersize salmon in the mix. The feeders have been hitting cop car coyote spoons in the three and a half and four inch size. Other coyote spoons that have worked are nasty boy the cop car glow and blue and green nickel. Green Spatter back hootchies have been working as well. Anchovy in Chartreuse Rhys Davis Teaser Heads are good but with lots of undersize feeders in the mix one can go through a lot of bait. Winter Springs are in deep water. It is not uncommon to find them in most areas of Barkley Sound from 100 to 145 feet. The Winter Chinook will always be found where one finds go sized bait balls. As mentioned Coyote Spoons in the three and a half to four inch size have been working. Other great spoons to have on board are glow cop car, nasty boy, Green glow, and green and blue nickel. These are good choices for fisher persons to have in the tackle box. Hootchies are popular but use a shorter leader length than in the summer. Leader lengths from 34 to 38 inches behind a glow green or glow red hotspot flasher are a good choice. The Purple Haze hootchie as well as various whites and greens are also excellent choices. Anchovy is also something all sport fisher persons should have on board. There are days when the salmon will touch nothing else but anchovy. Anchovy in chartreuse or a green glow Rhys Davis Teaser Head is a good choice. Most of the current feeder Chinook landed has been in the 100 to 130 foot level. The first salmon fishing derby on Vancouver Island’s West Coast will once again occur in Barkley Sound and is based out of Poett Nook. The Sproat Loggers Derby will take place the first Saturday and Sunday of March. The Derby is very popular and offers some great prizes and often some great weather and fishing. The derby surprisingly has some good sized feeders landed. It is not uncommon to have fish over twenty pounds entered. Summer fishing in Barkley Sound especially on the surf line most years occurs from late May to early September and is expected in 2015 to be relatively good due to the migratory movement of salmon along the west coast. Good numbers of Chinook, Coho and Pink Salmon will be moving to watersheds to the South. The migratory flow of Chinook should predominately be 4 year olds. The vast amounts of rich resources of bait fish in the Barkley Sound area during the summer months often bring the salmon into feed and rest before they continue their journey. Some world class fishing usually occurs at Meares, Cree, Edward King, Beale and as far in as Kirby Point and Swale Rock. We are really excited about the great sport salmon fishing opportunity we should have this summer in both the Sound and the Port Alberni Inlet. It is fairly difficult to go offshore during the winter months. There have however been some reasonably nice days on the water where the swell and water lump has been low. 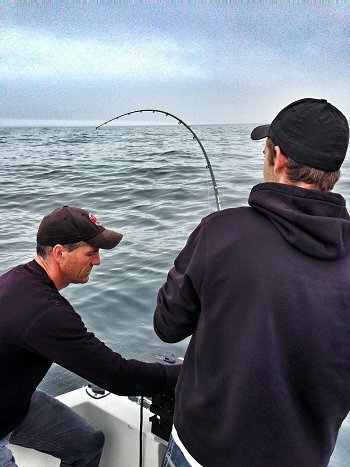 The best winter Chinook fishing is often fairly close to the Ucluelet Harbor and well into the Broken Group of Islands. This year has been no different. Beg Island, Mara Rock and Big Bear have had some results. As far in a Mayne Bay has actually had the best results. Needle fish, white hootchies, and various green hootchies, anchovy, and nasty boy, cop car, green glow, and silver glow coyote spoons have been the best bets to attract the feeder Chinook. In late February the feeder Chinook fishing really picks up and gets much better as the herring spawn gets close and as the herring move toward the beach the salmon chase. In the early spring we often feature our Seafood Safari. This is a great trip on the open Pacific where guests can be treated to some excellent winter Chinook fishing, bottom fishing, prawn and crab fishing. There might even be opportunity to find some oysters along some of the magnificent beaches of the west coast. The end of the day often has guests preparing a wonderful gourmet seafood dinner at a local resort or bed and breakfast. There are spots that the preparation of the days catch will be prepared for guests. Summer sport salmon fishing out of Ucluelet looks again very promising. Year after year Ucluelet has some of British Columbia’s best and most wonderful fishing opportunities. The outlook for Chinook and Coho migrations look similar to the past few years. We expect late May into mid September to have some of the best salmon fishing. For those that enjoy Pink Salmon fishing the odd year is back and returns of Pinks to various rivers along the west coast should be very good. 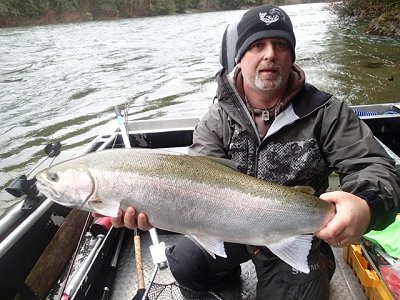 The Stamp to date has provided some very good winter Steelhead fishing. The fishing in one simple word has been “consistent”. The fish are beginning to spread out and can be found in the upper and lower river. Water conditions up to this past mid week were excellent until the last Pacific Pineapple Express hit the West Coast with a vengeance. With the previous water levels being relatively ideal the migration of Winter Steelhead has been good with some good fishing in both the Upper and Lower Stamp River. Guided trips on average have been hooking into five to seven fish per guest group each day. The mix of hatchery Steelhead compared to wild have been almost 50-50 on a percentage basis. For those on foot the most popular area is the falls pool which over the past few weeks has been very congested with sport anglers, especially on weekend days. 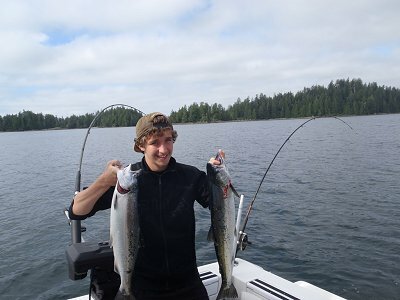 The Sproat has also had some great fishing days as of late. Those individuals on guided and non-guided trips fishing with a float and below “the bucket” have had good success using natural bait in roe, roe bags, and shrimp. Lures in artificial are allowed only from “the bucket” up river. In the “no bait zone” corkies, spin’n’glows in rocket red and peach are working very well. Below “the bucket” if not using bait pink worms, blades and gooey bobs are all working very well. One sport angler fishing close to the confluence was using a pink jig which like pink worms, for the most part, works best in the Upper River, had an unbelievably successful day during the past week by hooking into five or six Steelhead. The Winter Steelhead have been good sized fish into the mid teens. We are expecting the February and March Stamp River winter Steelhead fishing to be very good right through until the end of March.